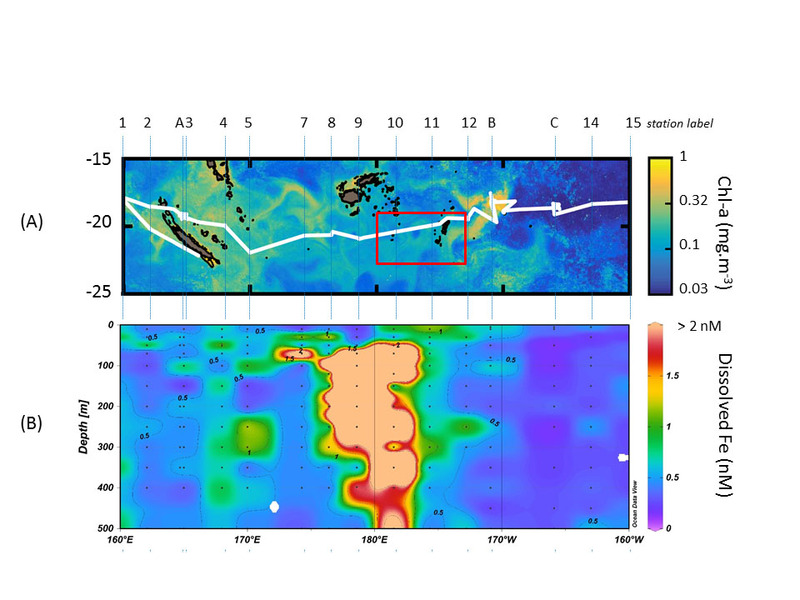 For the first time, iron measurements in the Western Tropical South Pacific reveal that shallow hydrothermal inputs from the Tonga Arc region fertilize the euphotic waters of this vast region. These results shed new light on the functioning of pelagic ecosystems in this region. Indeed, blooms in this area are dominated by N2-fixing organisms (or diazotrophs), with iron requirements higher than those of non-diazotrophic organisms. The measurements of trace elements along a 4000 km ~ 19 ° S transect during the OUTPACE campaign (https://outpace.mio.univ-amu.fr) together with Argo Float data and circulation modeling, allowed Guieu and co-authors to establish that the important mesoscale activity of the region makes it possible to transport, disperse and maintain high iron concentrations several hundred kilometers from the source. Figure: Surface Chlorophyll-a concentration (mg m−3) during the 45-day transect of the OUTPACE cruise (A) (The ocean color satellite products are produced by CLS. Figure courtesy of A. De Verneil). (B) Cross-section of dissolved Fe nM (0–500 m). Click here to view the figure larger.